Nothing is more patriotic than celebrating the revolution victory on the 4th of July with a big ole steak on the grill while shooting off fireworks. We have created something truly patriotic that will leave your taste buds ringing with glory! Using only the best, cold-processed microfiltered whey concentrate, you won’t find a better tasting, smoother mixing protein powder in all the land! But there would be nothing revolutionary about that, so we threw in some goodies to create our own fireworks show right in your mouth! Each flavor of Patriots Whey has bits and pieces of your favorite desserts to create a patriotic experience like nothing you’ve had before! Whether you are looking for keepsakes at the end of the rainbow or s’mores in the great Rocky mountains, we have something for you! 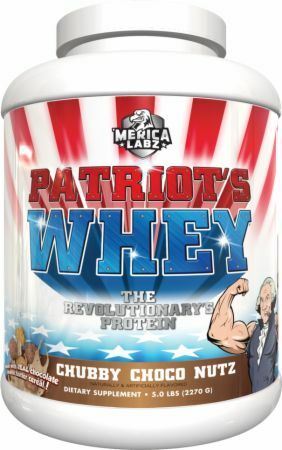 No Patriot's Whey Reviews Found. ** Percent Daily Value not established. ALLERGEN INFORMATION: Contains milk, soy (lecithin), and peanuts. Directions For Patriot's Whey: Add 1 scoops wto 6-8 ounces of cold water (according to preferred thickness and flavor) and shake or stir until mixed. Warnings: This product is only intended for use in healthy adults 18 years of age or older. Pregnant or nursing women should not use this product. Consult your healthcare provider before using this product, especially if you are taking any prescription, over the counter medication, dietary supplement product, or if you have any pre-existing medical condition including but not limited to: high or low blood pressure, cardiac arrhythmia, stroke, heart, liver, kidney or thyroid disease, seizure disorder, psychiatric disease, diabetes, difficulty urinating due to prostate enlargement or if you are taking a MAOI (Monoamine Oxidase Inhibitor) or any other medication. Discontinue use and consult your health care professional if you experience adverse reaction to this product. Do not exceed recommended serving. Do not use if safety seal is broken or missing. Keep out of reach of children.